Who wants to wait weeks for a permanent solution for a broken tooth or a complex cavity? While traditional dental crowns may have been a lengthy process, CEREC in Grafton from Kern Family Dentistry provides a same-day solution. Since we use this innovative in-office technology, you can get the long-lasting, natural looking oral restoration you need in one visit. Learn all about CEREC porcelain dental crowns in this post from Dr. Joe Kern. A crown is essentially a tooth-shaped “cap” that is placed over a tooth. They restore the shape and size of the tooth, and also make your smile look great because we use aesthetically pleasing porcelain. They’re usually used when a cavity is too large to be treated with a filling, to protect a weak tooth, or to cover a tooth that’s broken or has undergone root canal therapy. A digital camera will take a detailed picture of your mouth and the tooth that needs repaired. An advanced computer software will then convert that picture into the dental crown that’s right for you. Dr. Kern will prepare your tooth to make it ready for the placement of the CEREC crown. An in-office milling unit will create your perfectly designed crown from a single block of porcelain – all right there in Dr. Kern’s office, at the same appointment. Why Is CEREC Superior To Traditional Crowns? Traditional crowns are a drawn-out process. 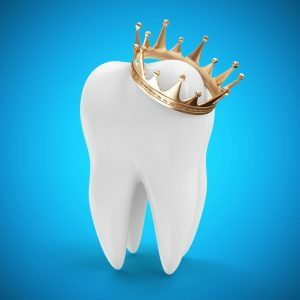 At your first visit, your tooth would be prepared, you’d have a molded impression taken to assist in making the crown, and that impression would be sent off to the lab. You’d have a temporary crown placed and then you’d be sent home to play the waiting game. After the lab finally completed your crown – a couple weeks later – you’d go back to the office for a second visit to have the permanent crown placed. While traditional crowns work just fine, there is a true difference in the patient experience when visiting Kern Family Dentistry as your dentist in Grafton. Who wants to come back for another visit when this technology makes a second appointment unnecessary? CEREC offers a convenient, long-lasting solution without the messy impression in the very same office visit. Yes! Although it might seem too good to be true, CEREC same-day crowns have been thoroughly researched and shown to be highly effective. We know from experience that patients love CEREC – but don’t take it from us. See for yourself – watch this quick video from The Doctors TV show on how this same-day solution performs. Now that you know all that CEREC from Kerns Family Dentistry can do for you, schedule your appointment today and restore your smile to its former glory!